"PULL IT OFF: REMOVING YOUR FEARS AND PUTTING ON CONFIDENCE"
Los Angeles, Calif. (May 29, 2018) – Julianna Zobrist, author, inspirational speaker, pop music artist, fashion muse and popular social media influencer (instagram.com/juliannazobrist/) releases her new book titled “Pull It Off: Removing Your Fears And Putting On Confidence” via Hachette Book Group on Sept. 18. It is available for pre-order now. Through her unique sense of individualism, Zobrist was inspired to write “Pull It Off,” as she is constantly asked, “how do you pull it off?” – being a mother of three, recording artist, fashion muse (appearing at events for Gucci, Burberry, NY Fashion Week and others, styling her own shoots and events), charitable advocate, inspirational speaker and the wife of Chicago Cubs World Series MVP Ben Zobrist. “Pull It Off” is designed to inspire people from all ages and walks of life who share a common humanity, and a need to understand their true identity. The powerful new book reflects Zobrist’s highly embraced message, which she consistently expresses through her popular social media platforms, and encourages others to release themselves from what she calls the “shoulding” and expectations of people, culture and society. Zobrist, who appears regularly before diverse audiences, recently appeared before members of Congress, has sat before two U.S. presidents and performed at multiple World Series and regular season MLB games, shares her down to earth and heartfelt personal stories in “Pull It Off.” The 13-chapter collection showcases her authentic anecdotes and straight up sense, as she dynamically fuses the concepts of empowerment with vulnerability. In “Pull It Off,” Zobrist unveils her signature phrase “Don’t Should on Me” -- how you should look; what you should say; how you should parent -- a concept that helps people understand a better way to express their opinions. Instead of conforming to societal demands especially on women reflective of today’s society, she inspires others to have the confidence to stand strong to one’s inner self. 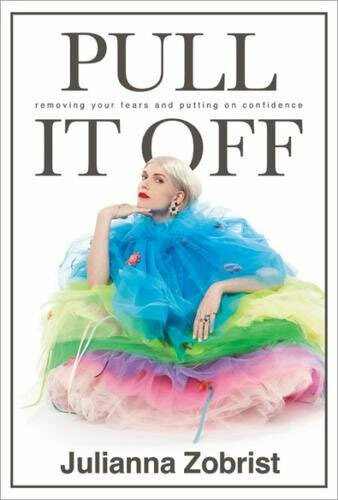 “Pull It Off” features hard-won truths and revelations by a woman who has learned enough about herself and the world to help others break through conformative ways of thinking. “My hope is that others will find the same freedom to confront and dismiss the ‘shoulds,’ lean into their unique gifts, and live a courageous, confident and brilliant life!” she says. Julianna Zobrist is a rural Iowa City girl, raised on classical music, Michael Jackson and farm-grown corn. Since her recent record release of Shatterproof, Julianna has performed at numerous venues nationwide and has been featured by top media including Forbes, Huffington Post, CBS, FOX, Beauty Atlas and Sports Illustrated. Julianna divides her time between Nashville, TN and Chicago, IL, while literally traveling through life with her husband Ben and three kids. Hachette Book Group (HBG) is a leading U.S. trade publisher and a division of the third largest trade and educational book publisher in the world, Hachette Livre. In one year, HBG publishes approximately 1,400+ adult books, 300 books for young readers, and 450 audiobook titles. In 2017, the company had 167 books on the New York Times best-seller list, 34 of which reached #1. HBG’s bestselling authors include Mitch Albom, Stephen Colbert, Newt Gingrich, Neil Patrick Harris, T.D. Jakes, Joyce Meyer, Stephenie Meyer, Walter Mosley, Joel Osteen, Gwyneth Paltrow, James Patterson, Keith Richards, J.K. Rowling, J.D. Salinger, to name a few. In addition to selling and distributing its own imprints, HBG provides a wide range of custom services to third-party publishers, such as distribution, fulfillment, digital and sales services including: Harry N. Abrams, Chronicle Books, Disney Book Group, Time Inc. Books, Hachette UK, and many more.